Marcy leader chosen 2019 Wisconsin Elementary Principal of the Year - Hamilton School District. Marcy Elementary School Principal Michele Trawicki was selected the 2019 Wisconsin Elementary School Principal of the Year by Association of Wisconsin School Administrators (AWSA). 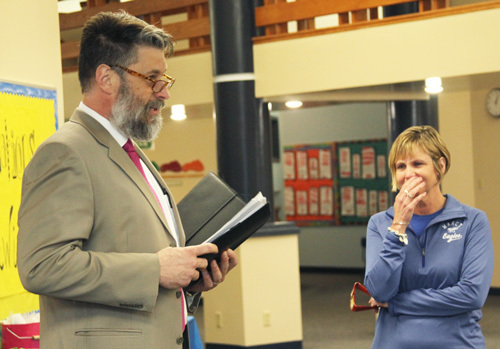 AWSA President and Superior Middle School Principal Rick Flaherty (left) made a surprise announcement to Marcy Elementary staff that their principal, Michele Trawicki, was selected Wisconsin’s 2019 Elementary Principal of the Year. 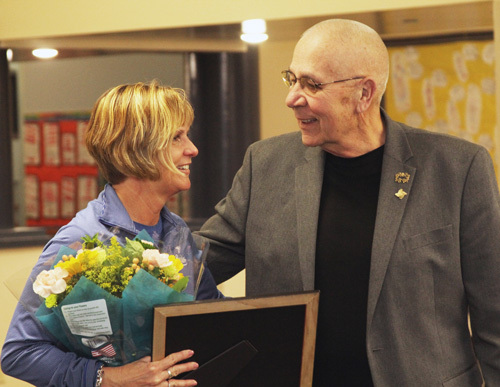 Trawicki, who has been Marcy principal since 2008, was presented with the award April 5 at a surprise presentation in front of her staff, Hamilton School Board members and family. In a written statement, AWSA Executive Director Jim Lynch characterized her as an effective school leader who is known for her ability to form strong teams of teacher-leaders who relentlessly work to raise student achievement and engage parents and families in the learning process. Hamilton Superintendent Paul Mielke, Ph.D., credited Trawicki with empowering her staff to play an active role in selecting effective professional development and working to ensure parents are closely involved in the learning process. Every year the state asks parents, teachers and others to nominate excellent leaders for state and national Principal of the Year Programs. Trawicki was among the twelve leaders who were selected in February for the Herb Kohl Foundation Principal Leadership Awards. From the Kohl principal recipients, one is selected as Wisconsin’s Elementary Principal of the Year. Trawicki has been principal at Marcy since 2008. Before then she had been principal for three years at Tonawonda Elementary School in the Elmbrook School District where she started in 1993 as a second grade teacher and was then an instructional resource teacher before becoming principal. She began her education career as a first grade teacher in the Wausau and Whitefish Bay school districts. She earned her bachelor’s degree in elementary education from UW-Stevens Point in 1989 and her master’s degree in educational leadership from Cardinal Stritch University in 1995. Trawicki will represent Wisconsin this fall when she attends a ceremony in Washington, D.C. that will include the other 49 state principals of the year. She was presented with a $500 check to offset travel costs, and $1,000 for a project at Marcy. Supported by the Meemic Foundation, the Principal of the Year award recognizes school leaders who have helped drive student learning, foster instructional collaboration and create safe and positive school environments. Recipients are selected based on their dedication to professional excellence, leadership skills and service to their communities. 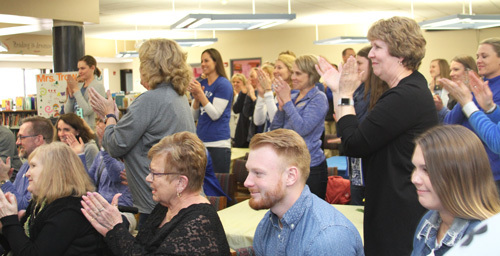 Marcy Elementary School staff members gave their principal a standing ovation. 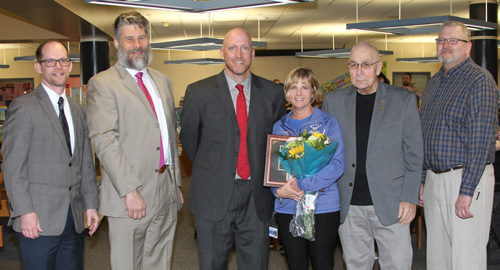 Hamilton School Board President Gabe Kolesari (right) congratulates Marcy Principal Michele Trawicki who was chosen 2019 Wisconsin Elementary School Principal of the Year. AWSA Executive Director Jim Lynch, AWSA President Rick Flaherty, Hamilton Superintendent Paul Mielke, Ph.,D., Marcy Principal Michele Trawicki, Hamilton School Board President Gabe Kolesari and MEEMIC Insurance Company Agent Dan Stefanovich.